Benefits: Cinnamon has a long history of use as a culinary spice in many cultures. In addition to its culinary uses, in native Ayurvedic medicine cinnamon is considered a remedy for respiratory, digestive and gynaecological ailments. In the 1980’s Japanese research into Cinnamon’s constituent cinnamaldeyde showed it to be sedative and analgesic. It is also thought to reduce blood pressure and fevers. Extracts of the bark have antibacterial and antifungal properties. It’s medicinal value is mainly due to its volatile oil which has antiviral and stimulating properties. Cinnamon can also be used as a carminative addition to other herbs. In India and Europe, it has been traditionally taken as a warming herb for “cold” conditions, especially to the fingers and toes. Also, it is used for digestive problems such as nausea, vomiting and diarrhea as well as aching muscles and other symptoms of viral conditions such as colds. It is very much a supportive and strengthening herb when used for weak digestions. It does stimulate the uterus and encourage menstrual bleeding. It India, it is taken after childbirth as a contraceptive. Not to be confused with cassia (Cinnamomum cassia (L.) J.Presl or synonym C. aromaticum Nees) which is cheaper, has a stronger flavour and is often marketed as ‘cinnamon’. Active Constituents: Volatile oil containing cinnamic aldehyde, tannins (condensed), coumarins, mucilage. Contraindications: Caution during pregnancy due to its stimulating effect on the uterus. In large amounts it may cause nausea and vomiting. A large amount of the pure oil when ingested may cause kidney irritation and even damage. Cinnamon oil may cause allergic reaction. 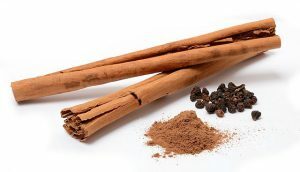 Background: Cinnamon’s history as a medicinal plant goes as far back as the Ancient Egyptians and Chinese. As the availability across Europe increased it was then adopted by herbalists for medicinal uses.